Sabaudiae, et Burgundiae Comitatus Descriptio. This is a rare 1579 Abraham Ortelius map of Burgundy (Bourgogne), France. Centered on Lake Geneva, Ortelius' map covers from Lyon, France to La Chaux-de-Fonds, Switzerland and from Vesoul to Rivoli, Italy. The modern region of Haute-Savoie and the neighboring department of Savoie were, until 1860, part of the Kingdom of Sardinia. The color coding in this map depicts the territorial boundaries of the time. The region of Burgundy in France is famed for producing the world's finest wines. The map features a decorative title cartouche in the lower left quadrant. Shows the region in wonderful detail with attention to forests, cities, lakes, rivers, villages and other topographical features. 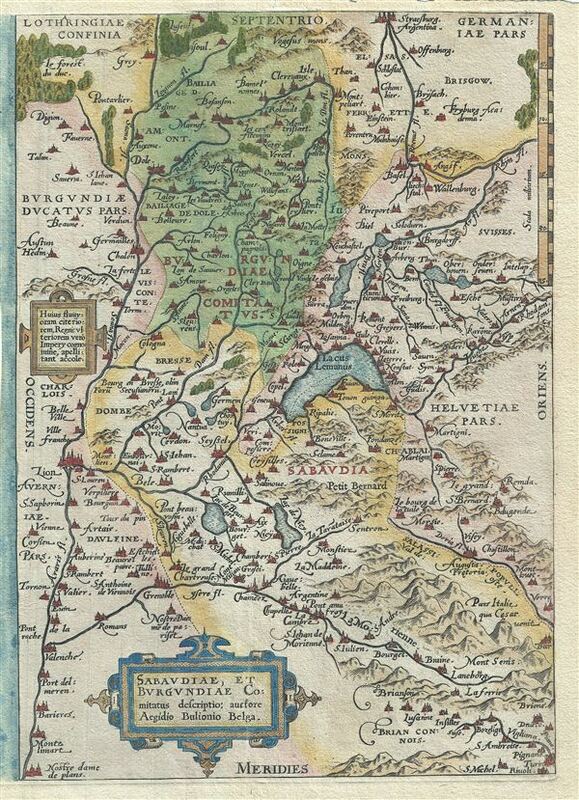 Cartographically based on the map by Boileau de Bouillion, this map was published in Antwerp by A. Ortelius in 1579 for issue in his seminal atlas Theatrum Orbis Terrarum. Good. Overall toning. Blank on verso. Framer's tape on verso. Unusual margin coloration on left side of map.